The kitchen, as we had hoped, is turning out to be the true heart of our new home. It is the biggest room and is right in the middle of everything. I knew when I walked into the house the first time that I loved it. As a mom & wife, I know the importance of a good kitchen. It feels like you spend the majority of your day making meals, cleaning up after meals, and putting away dishes. One of my dreams for our new home was to have a window over the kitchen sink. 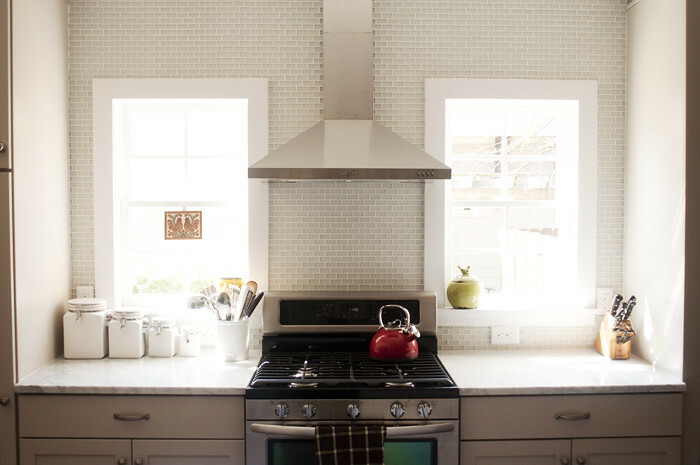 This kitchen doesn't have that, but I have two wonderful windows on either side of the stove. This time of day they pour light into the kitchen. This spot, is at the very top of my list of favorite places in this new house. Beautiful! Love all the energy from the light! So pretty! I love your tile!